Northern Ireland is the smallest of the four countries that make up Great Britain, and is situated in the north east corner of the island of Ireland. Considering its size, the variety on offer in Northern Ireland is quite amazing, from undulating countryside and breath taking mountains, intriguing towns and villages to some of the most vibrant, culturally rich and historical cities. 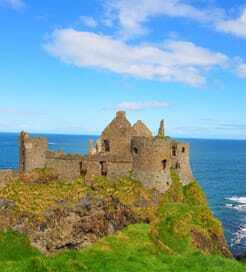 Northern Ireland is one of those destinations that not only promises, but delivers. Northern Ireland's size makes the country simple to navigate too which means it’s easy to visit the country's best attractions. There are of course many must-see places and sites including the Giant's Causeway, the Carrick-a-Rede Rope Bridge, the historic walled city of Londonderry, and aside from the usual attractions of a country’s capital city, Belfast is also the home of Titanic Belfast, the world's largest Titanic visitor experience. Northern Ireland features excellent fast ferry links from England and Scotland with ferries sailing to the major ports at Larne and Belfast. If you want to travel from continental Europe to Northern Ireland then you can sail from France to Ireland and drive across the border. For more information, please visit our Ferries from England to Northern Ireland page.